You've seen someone do it. Breathe on his binocular's eyepiece and then rub the glass with the corner of his shirt. Poor guy, he never knew he just degraded every image he would ever see with that binocular again. The breathe-and-rub method is really a formula for frosting the glass—like a glass shower door. A primary ingredient of dust is silica—in other words, tiny rocks. Silica is harder than glass. If you rub dust across your eyepiece, you gouge microscopic scratches into the glass and the ultra-thin coatings on lenses. So the first rule of cleaning binoculars is GET THE DUST OFF BEFORE YOU RUB. Or blow with a can of air (from photo store). Don't use your breath — breath includes minute droplets of water that will spot your lens. Moisten a Q-tip with water or lens cleaning solution and float off any remaining dust. 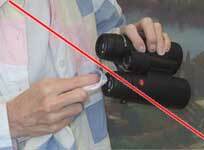 Or if your binocular is waterproof, you can actually run it under the tap (but don't squirt it hard). DO NOT use fluid designed for cleaning eyeglasses or windows, as it may attack the coatings. Remember! More binoculars have been ruined by wrong cleaning than by being dropped on the sidewalk. One of our favorite starter binoculars is the Audubon Compact. It is one of our best-selling binoculars. We recommend it because it offers decent optics that will really let you see birds up close, but the price will fit nearly every budget. In fact, you can't get a better binocular for the price. It comes in 8x25 (magnifies 8-fold) and 10x25 (magnifies 10-fold). We suggest the 8x25 for a first binocular, because its wider field of view makes it easier to find the bird through the binocular.